Only five of the top 20 ports in the world are now located outside of East Asia. 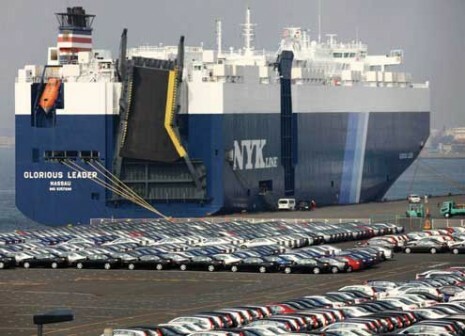 The Port of Los Angeles is the only U.S. entrant in the top 20, and only three European ports made the cut. Today, trade is more likely than ever to flow through the South China Sea. United Airlines (UA, Chicago O’Hare) has announced that it has applied with the US Department of Transportation for authority to launch 3x weekly service linking its New York Newark hub with Cape Town starting from December 15, 2019. If approved, the service would be operated with United’s B787-9s and become United’s only service to the African continent since 2016, when it terminated its daily Houston Intc’l–Lagos flights. United also used to serve Accra until 2012. According to the ch-aviation capacity module, Delta Air Lines (DL, Atlanta Hartsfield Jackson) and South African Airways (SA, Johannesburg O.R. Tambo) are currently the only two carriers linking the United States directly with South Africa. Delta operates a daily B777-200 service from Atlanta to Johannesburg O.R. Tambo, while SAA operates daily from New York JFK to Johannesburg using A340-600s. Using a mix of A330-200s and A330-300s, South African Airways also links Washington Dulles with Johannesburg on a daily basis with two weekly services stopping at Dakar Blaise Diagne Int’l and five operating via Accra. 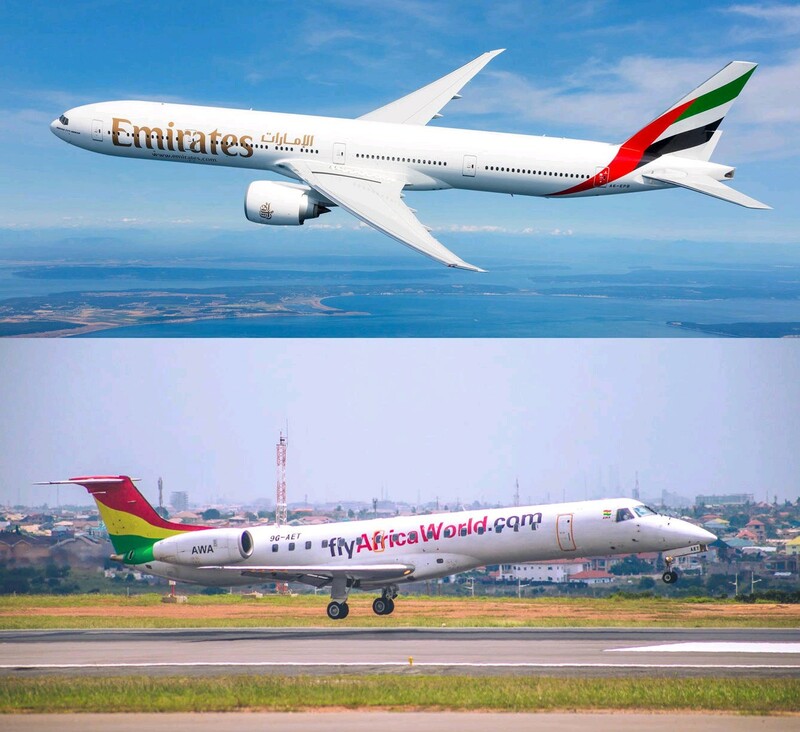 Emirates, the world’s largest international airline, and Africa World Airlines (AWA), the Ghanaian airline headquartered in Accra, have announced a one-way interline agreement whereby Emirate customers can connect onto selected routes of Africa World’s Airlines’ network, opening up new African destinations for Emirates customers from May 2019. “The agreement between Emirates and Africa World Airlines underpins our commitment to provide greater connectivity across West Africa via the selected domestic and regional routes of Africa World Airlines”, said Orhan Abbas, Emirates Senior Vice President, Commercial Operations, Africa. “Africa World Airlines is proud to partner with Emirates in order to connect passengers through our hub at the new Terminal 3 in Accra. Customers will enjoy seamless connections at the premier gateway to the West African region as a result of this new agreement”, said Sean Mends, Chief Operating Officer for Africa World Airlines. Emirates passengers can choose from seven weekly flights from Dubai to Accra until 2nd of June, 2019, when Emirates will increase services on the route to 11 weekly flights. The agreement with AWA will further extend Emirates’ connectivity from Accra with up to ten flights daily daily to Kumasi, four flights each to Tamale and Takoradi and six weekly flights to Monrovia and Freetown. Between Dubai and Accra, Emirates operates the Boeing 777-300ER, one of the most technologically advanced and efficient aircraft in the world. The aircraft’s advanced wing design, efficient engine and light structure makes more efficient use of fuel. This means significantly less emissions than similar aircraft, making it one of the most ‘green’ long commercial aircraft types. Passengers in all cabin classes can enjoy Emirates’ award-winning entertainment on ice – the airline’s in-flight entertainment systems that offers 4,000 channels of in-flight entertainment. Customers will also enjoy complimentary beverages and regionally inspired meals, as well as the warm hospitality of the airlines’s multi-cultural cabin crew. Passengers can also stay connected to family and friends during the flight with up to 20MB of complimentary Wi-Fi. Africa World Airlines (AWA) is Ghanaian airline based in Accra. AWA started opertions in 2012 and now operates a fleet of 8 all-jet aircraft across 8 destinations throughout Ghana, Nigeria, Liberia and Sierra Leone, with services to Cote D’Ivoire planned to commence in May 2019. AWA is the only IATA member airline registered in Ghana, and maintains IOSA certification, the global gold standard for aviation safety. The ground handling and cargo management services extend NAS’s existing investments in Mozambique. MAPUTO, Mozambique, April 8, 2019 – National Aviation Services (NAS), the fastest growing aviation services provider in the emerging markets will offer comprehensive ground handling and cargo services in Mozambique beginning July 2019. This covers ramp, passenger and engineering services and include check-in, boarding, ramp handling, maintenance, cleaning as well as import and export cargo handling and storage, for scheduled as well as adhoc airlines at all airports in Mozambique.